Tarweeds — and Their Evil Cousin! What Are Tarweeds? Whoever came up with the name “tarweed” didn’t do the plant any favors. True, the plants called tarweeds do have a sticky, sometimes black exudate secreted by glands on their leaves, stems and flower buds, and often have a turpentine-like smell. 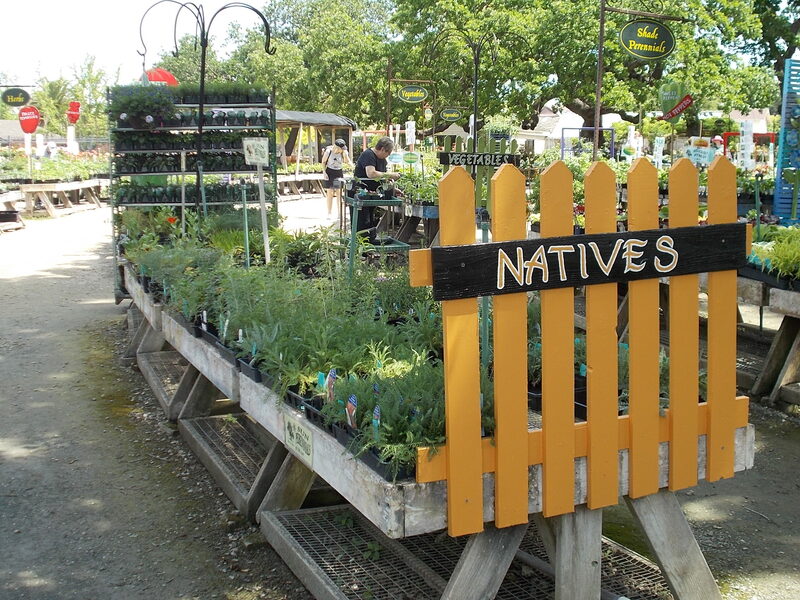 But to liken them to tar seems unfair and uncomplimentary, considering their beauty, captivating aroma and usefulness to the Native Americans and to wildlife. However, there are exceptions, as we shall learn later in this essay. Besides, they didn’t evolve to please us humans, but to fill an important environmental niche, and to guarantee their own survival. Tarweeds and Terpenes Plants produce a great number of chemicals which are useful to them for numerous physiological and ecological purposes. Some taste bad and discourage herbivores from eating them. Others provide immunity from pathogens such as bacteria and fungi, or resistance to plants competing for the same space. They might also protect the plant from drying out in the summer, and even offer some shielding from ultraviolet radiation from the sun. Others are volatile enough to escape into the air and either attract pollinators, or signal an invitation to insects and birds that feed on organisms which are otherwise intent on devouring the plant. Terpenes are a large and diverse class of chemical compounds that serve these purposes. We are already aware of them in conifers, rosemary, mints, sages, basil, citrus fruits and even marijuana. And in the numerous plants we call the tarweeds. Many of these chemicals have aromas that humans either find attractive (as in the scent of flowers, spices and essential oils) or repulsive (as in the stench of cannabis and stinkwort, a plant which we will encounter later). Some are even thought to have medicinal properties, and help in fighting bacteria, fungus and environmental stress. Vitamin A is a terpene. Yellowflower Tarweed or Narrow Tarplant This tarweed, also called virgate tarweed or pitgland tarweed (Holocarpha virgata) is the featured tarweed at the Granada Native Garden. (A related species, gumplant (Grindelia camporum), also grows at the GNG.) It flowers from May into fall with pretty little yellow aster-like blossoms. The aroma that radiates copiously from its foliage reminded one recent visitor of turpentine, but it makes me think of a barber shop. I’m not sure why. I like to embrace a clump of yellowflower tarweed and come away with its slightly sticky but refreshing scent on my clothing and arms, which usually follows me home. 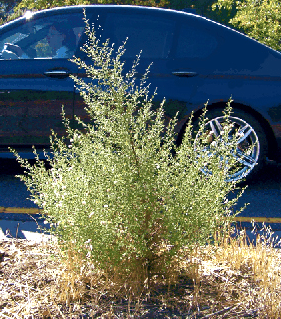 In the Sacramento Valley, yellowflower tarweed thrives in the hard packed soil along roadsides and vacant lots. Whether it is considered a weed or not (a “weed” is something that grows where you want something else to grow), depends on your point of view. Birds and mammals relish the seeds. The pollen is an important food source for bees. On the other hand, it flourishes in fields where livestock graze, and while livestock use the young plants as forage in winter and early spring, it becomes unpalatable as it increases in size and terpene content later in the season. Livermore Tarplant Move over, Livermorium (atomic element number 116, of which only a few atoms have ever been made and which only exists for a few milliseconds at a time anyway). 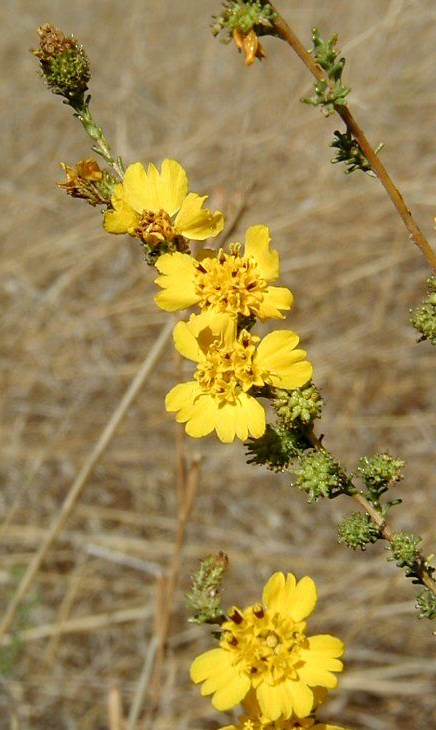 Livermore now has its own tarweed, Deinandra bacigalupii or the Livermore tarplant. First described as new to science in 1999, the Livermore tarplant only occurs within a half-mile of the City of Livermore in Alameda County. 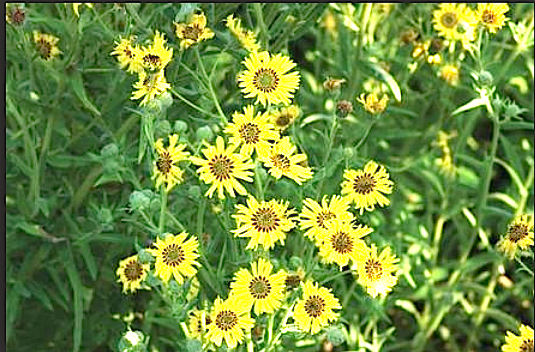 The plant grows in poorly-drained, seasonally-dry alkaline meadows. It is found in three places within 90 acres of the Livermore Valley, places that are subject to frequent disturbance, including road construction, off-road vehicle use, and application of herbicides. These challenges, in addition to encroachment and competition by non-native species, threaten the survival of the plant. 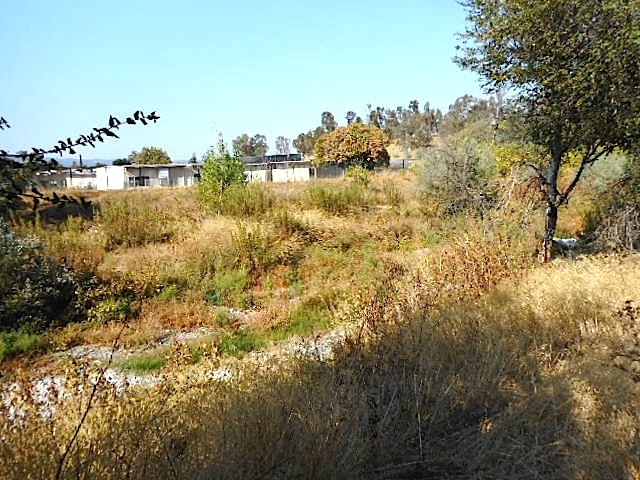 The largest area of Livermore tarplant habitat is on property owned by the City of Livermore, and all other Livermore tarplant habitat is on private property. 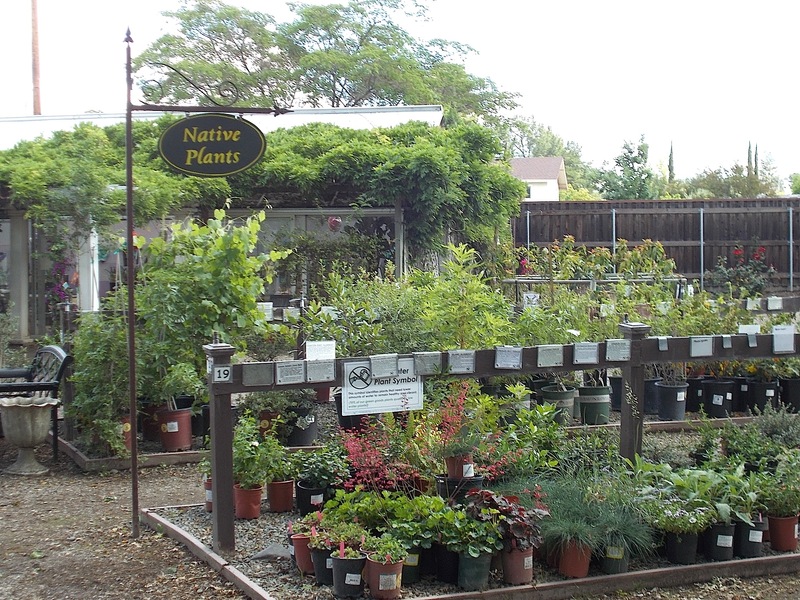 One of the Livermore tarplant populations was almost completely destroyed by the operations of a landscape business in 2014. Two years after Heath Bartosh, Rare Plant Committee Chairman of the East Bay Chapter of the California Native Plant Society, petitioned the California Department of Fish and Wildlife to list this rare endemic species as endangered, the California Fish and Game Commission voted unanimously to grant the Livermore tarplant endangered status. 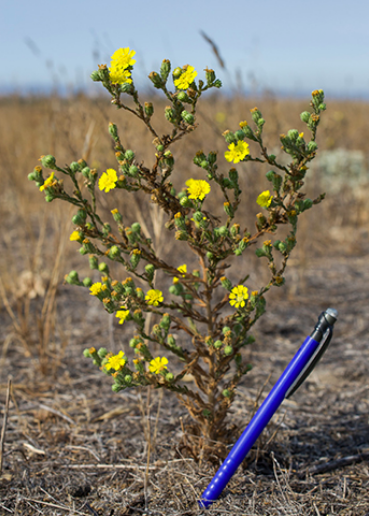 Livermore tarplant was the first plant in nearly a decade to be added to the California Endangered Species list. This means that killing or possessing the plant is prohibited by the California Endangered Species Act. Stinkwort – The Tarweeds’ Evil Cousin! 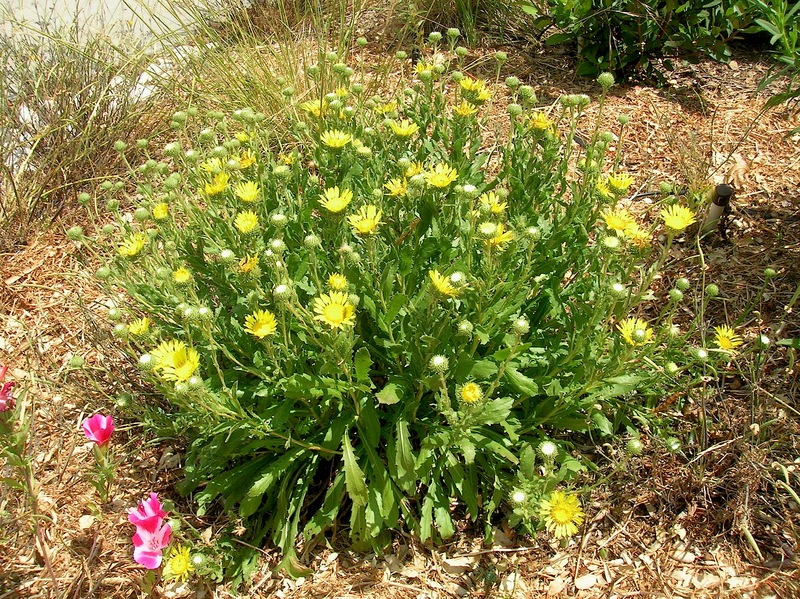 In 1984, a new tarweed was discovered in Milpitas, California. But unlike the Livermore tarplant, stinkwort (Dittrichia graveolens) is not a native tarweed. It is a Mediterranean native that has found its way here and decided to stay. By 2017, it had spread to 41 of the 58 counties in California. Now it is a common and prolific resident of our state, owing to the high viability rate of its seeds (90%), capable of germinating at any time of the year in neglected landscapes, and its ability to spread by wind, on the fur and feathers of animals, and by motor vehicles and equipment along transportation corridors (because of its sticky seeds). I suspect that, very shortly, it will become the dominant vegetation in places where it has got its start, unless aggressive and continuous measures are taken to eradicate it. The best means of eradicating stinkwort (if that is ultimately possible) is to pull it up by its roots, preferably by mid-September. This is fairly easy if the plant is only 1-2 feet tall. Larger specimens need to be cut at the base, preferably below ground level. Any plants that have begun to flower should be bagged and discarded, but what happens to them after that is anyone’s guess. 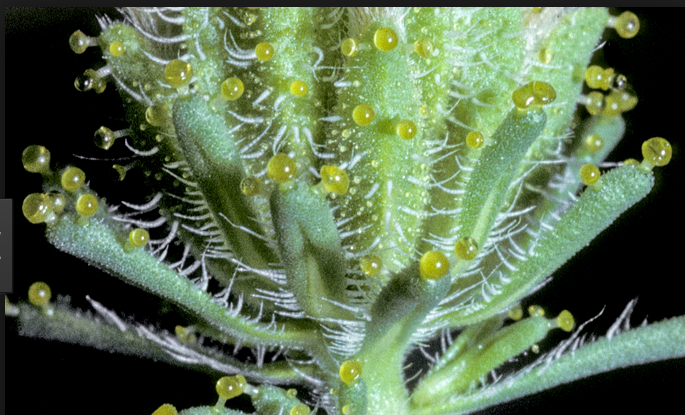 Stinkwort’s terpenes are aromatic, similar to those of H. virgata which it resembles in appearance and, to some extent, its not objectionable odor. But if you are tasked with the job of pulling it out in places where it has infested heavily, the name “stinkwort” is appropriate. My introduction to the tarweeds took place a few years ago while spending a morning doing exactly that. Afterward, I had to take a shower and launder my clothing. Its terpenes can, reportedly, cause contact dermatitis, itchy skin or blistering in humans. Besides being generally unpalatable to animals, if it is eaten by livestock, barbed bristles on the seeds can puncture the small intestine wall and cause enteritis. It will make their milk taste bad, too. But stinkwort is a California native tarweed mimic. After 1865, the perennial native grasslands were largely grazed to dust by cattle. This allowed the native tarweeds to flourish. But then the native tarweeds were largely wiped out by herbicides in the 1950s in order to create rangeland for cattle. So when stinkwort arrived in California, it quickly filled in the ecological niche left by the mostly extinct natives, making it a prime example of a highly aggressive non-native species. Stinkwort also contains two phytotoxins, tetrahydroaromaticin and ilicic acid, that inhibit the growth of other plants around it, giving it a competitive advantage over other plants, including natives. It is now being found growing abundantly along the Arroyo Mocho that borders the Granada Native Garden. Eternal vigilance is the price of a stinkwort-free garden!